Clouds are a marvelously complex thing. We’re not talking about the fluffy white ones in the sky, we mean clouds of the tech variety. They are quickly becoming an integral part of business operations and will change the way we all conduct business. Coincidentally, as the cloud picks up steam, we will need to upgrade our computers to keep up with the changes, but the next upgrade may be a bit different from the last. Computers have gone from widely singular machines to being networked together and able to share information between other users quickly and easily. The latest evolution of this network is the cloud. While the cloud is still in it’s early stages, it’s advancing at such a fast pace that we could soon be operating largely in the cloud. In fact, there are a number of services that when combined allow businesses to operate almost entirely in the cloud. Here’s a simple example of how a company can operate almost exclusively in the cloud. Company XYZ uses Google Drive and Gmail for storage, document production and email (Microsoft Office 365 and SkyDrive is another option); Amazon Web Services for cloud server hosting; and VoIP for phone and fax systems. Couple this with a solid Internet connection and almost every major business function of Company XYZ can operate in the cloud. While Company XYZ operates almost exclusively in the cloud, many modern businesses still rely on older, ground based systems. If current trends hold true, they will be integrating more cloud solutions in the near future. Because the cloud moves a large part of business and ‘computing’ off the computer on your desk, the way you select your next computer has also changed. One might think that as files are stored in the cloud, there’s no real need for hard drives or systems with a ton of RAM. In truth, the hard drive and RAM are integral components of the modern computer. Companies using cloud systems will store the OS, essential programs and files, and backups on the hard drive of the computer. This means physical storage is still important. The cloud is dependant on your Internet connection, and if it goes down, you’re stuck. So, having file systems in place you can use while the Internet is down is a big help. Aside from that, RAM is important to the computer as it allows computers to run. The more of it you have, the faster a computer will be at running programs, and the more it will be able to do at the same time. Rather than space, companies will pick a hard drive and RAM combination that focuses on operating speed. This will likely be done through heavy use of Solid State Drives that are lower in storage capacity – for now -, but are a lot quicker. All of your essential programs will be online, reducing the need to pick and stick with one OS or system. You could allow your employees to choose the system they want to use, or even use their own systems. The one issue you will have to look into however is if your current systems can be integrated with cloud solutions. Don’t worry too much, as most modern programs have cloud based options. The most important components for a cloud based computer are USB ports to connect your peripherals, HDMI connections to connect monitors and Internet connection – ethernet or Wi-Fi. Other components, like processor, DVD/Disk drive, etc. play less importance as cloud solutions are typically less resource intensive. In other words, you can get away with systems that have lower, and therefore cheaper, components. Price has been and will continue to be the main determinate of which computers you buy for your company. The main difference here is that cloud services make more than one set system available, so you can shop around a little and maybe find a better computer, for less. The cloud is set to change the way we conduct business and even the way businesses choose computers. 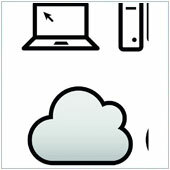 If you’re looking for new computers or would like to move into the cloud, please contact us.